Rupert Pupkin Speaks: Film Discoveries of 2016 - Eric J. Lawrence ""
"A musical line-up of criminally overlooked tunes, hidden gems, guilty pleasures and standout selections from the latest releases... from Jacques Brel to Mott the Hoople to Gary Numan to the Fall, and everything in between. Like playing poker with dogs -- only better." I can't really recommend the show higher than a decade of listenership can I? Check him out! I began last year immersed in gangster films, thanks to catching up with Warner’s DVD box sets in their Gangster Collection series. 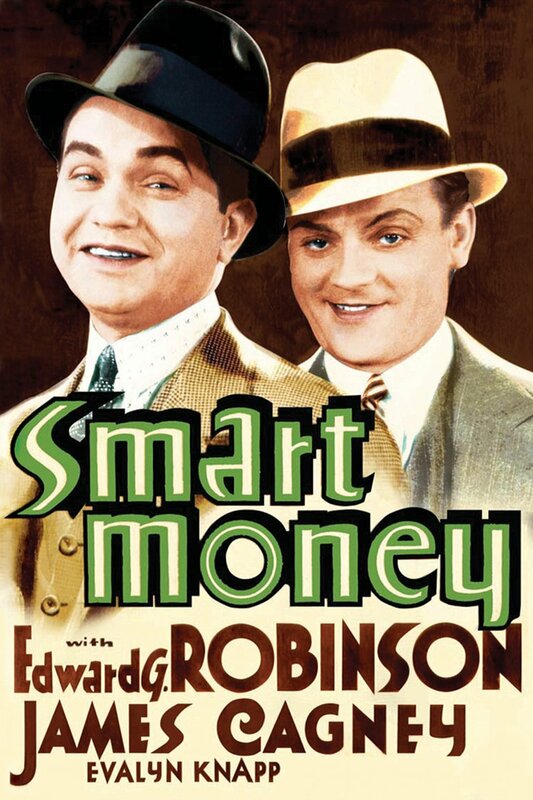 After rewatching the classics Little Caesar & The Public Enemy, the breakthrough films for Edward G. Robinson & James Cagney respectively, I went to their only collaboration, 1931’s Smart Money. Robinson was already at star, given the massive success of Little Caesar earlier in the year, but The Public Enemy hadn’t been released yet, so Cagney was relegated to second fiddle. Nonetheless, he gets some good bits to do & even gets called a “smack off” by Eddie G! Plus, Boris Karloff shows up in his occasional gangster roll. It’s a little less fatalistic of a film than most in the genre, with Robinson playing a lighter & less reptilian tough guy than his stereotypic persona, Cagney still bringing his free-wheeling energy, and an engaging story nicely realized for the brief period of adult-themed, post-sound and pre-Code films. 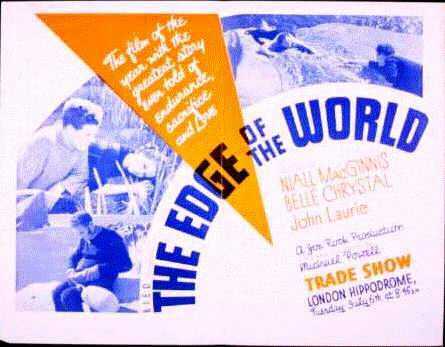 For legendary director Michael Powell’s first major film, he chose the daunting task of dramatizing the 1930 evacuation of the extremely isolated Scottish isle of St Kilda. Unable to film at the real location, Powell brought his cast & crew to the slightly-more accessible Foula in the north, where over the course of months, they completed the picture. Taking advantage of the gorgeous, rough-hewn terrain, he crafts a simple love story that also explores the plight of living such an isolated & unforgiving life. Not having access to modern amenities (for example, they would have to toss their mail in the sea in paper boats in the hope they’d be picked up by nearby ships), the small group of remaining islanders’ way of life is threatened every time a young person feels the urge to move to the mainland. A touching look at a forgotten way of life, and the real beginning to the career of one of Britain’s finest filmmakers. A nice combination of film noir and message picture, Elia Kazan’s Panic in the Streets gains much of its power from the on-location shots of New Orleans, from the seedy bars to the busy docks. 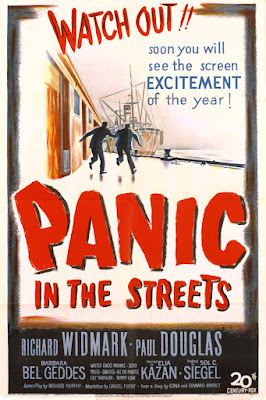 Of course having actors of the caliber of Richard Widmark, Barbara Bel Geddes, Jack Palance (in his film debut), Paul Douglas (from, among other things, Letter to Three Wives, which I also saw for the first time last year), and Zero Mostel (in an early, pre-blacklist, non-comedic role) doesn’t hurt. 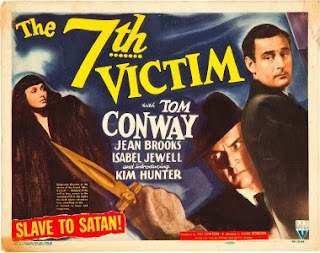 Although the core of the film is a beat-the-clock chase to keep a deadly plague from wreaking havoc in the city, various social topics are addressed, such as public health, illegal immigration, & the rights of a free press. And it features one of the most realistic depictions of a marriage I have seen in a film of that era. 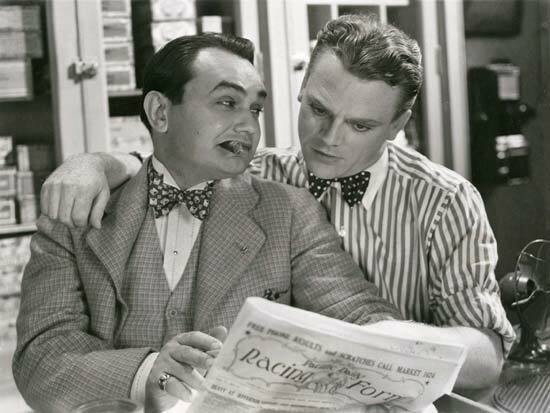 For Kazan, it was his last film before beginning a lucrative collaboration with Marlon Brando, who starred in A Streetcar Named Desire a year later. Speaking of Brando, I was curious to see how he fared in a Shakespearean setting, given his legendary reputation as a Method actor who would sometimes mumble his delivery in the spirit of realism. Apparently many people were similarly concerned, including director Joseph L. Mankiewicz, who had Paul Scofield ready as a back-up if Brando failed the screen test. But he passed with flying colors, impressing both his costars (especially John Gielgud, who offered to direct him in a stage production of Hamlet) and the Oscar voters, giving him his third nomination for Best Actor in as many years (he won the following year for On the Waterfront). What is particularly remarkable about his performance is how accessible & modern it still feels, particularly in comparison with his older counterparts, including James Mason, Edmund O’Brien, Greer Garson, George Macready, Alan Napier, John Hoyt & the aforementioned Gielgud. 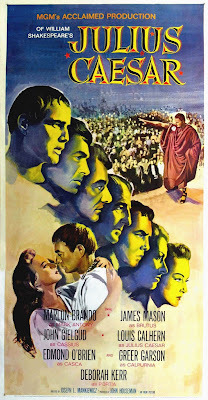 Not that they are bad – they are all uniformly terrific – but Brando’s energy absolutely bursts through the screen without resorting to any Shakespearian hamminess. 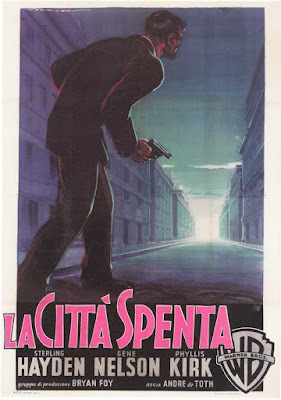 A tight, taut, short, but sweet thriller from one of the best, DeToth! Gene Nelson plays an ex-con trying to go straight, but circumstances keep dragging him back in, this time in the hulking shape of noir-favorite Ted de Corsia, while the equally hulking detective (Sterling Hayden, always shot from low angles) destroys numerous toothpicks in his cynical search for somebody to nail for a gas station heist. Exhausting most of the budget with a worthy cast, including the very watchable Phyllis Kirk and very young Charles Bronson (aka Charles Buchinsky), two holdovers from the director’s previous film, House of Wax, plus a dose of legendary Hollywood weirdo Timothy Carey as, what else, a maniac, DeToth uses location shooting for most of the film, from downtown LA’s City Hall to the nearby streets of Burbank & Glendale, which makes for additional fun trying to spot the landmarks for Angelenos such as myself. A superior, but oft-overlooked film noir classic. 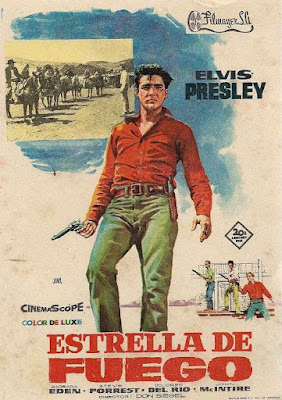 The first of a few Elvis Presley movies I watched last year, actioner Don Siegel’s Flaming Star proved the best of the bunch, in great part because it was one of the last times Elvis was given a legitimate dramatic role to work with. 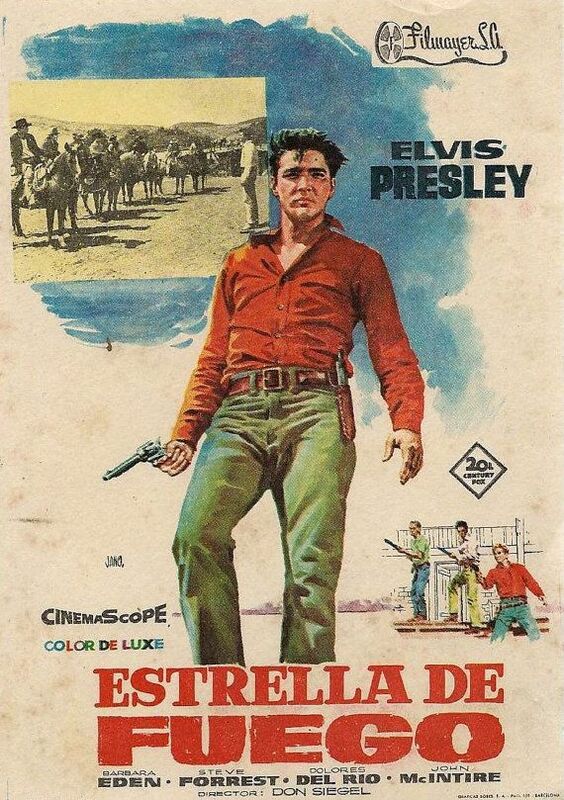 Playing a half-breed in West Texas just after the Civil War (in a role originally slated for Brando), Elvis tries to hold the peace between the local townspeople & the real locals, the Kiowa tribe that his mother (played by Dolores del Rio) belongs to. 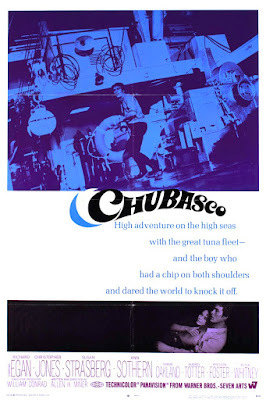 Between family infighting, racist rednecks, Indian raids, a gorgeous love interest in Barbara Eden, and the usual Western drapery, Elvis does a pretty remarkable job depicting a doomed outsider, and he keeps any obvious connection to his rock star status to a minimum (the title song & a brief hootenanny jam at the beginning being the only Elvis-y bits in the film). Of course, coming from Siegel (of Dirty Harry, The Killers, etc. fame), there is lots of action of a particularly brutal kind, and given that Elvis is at peak physical shape here (post-Army & post-black belt), he acquits himself with vigor. The film failed at the box office, so Colonel Tom put the kibosh on any future non-musical roles, which potentially robbed us of another side of Elvis that could have rivaled Kris Kristofferson or Sinatra (who was initially slated to play the Elvis’ characters’ brother in this film!) as musician turned serious actor. 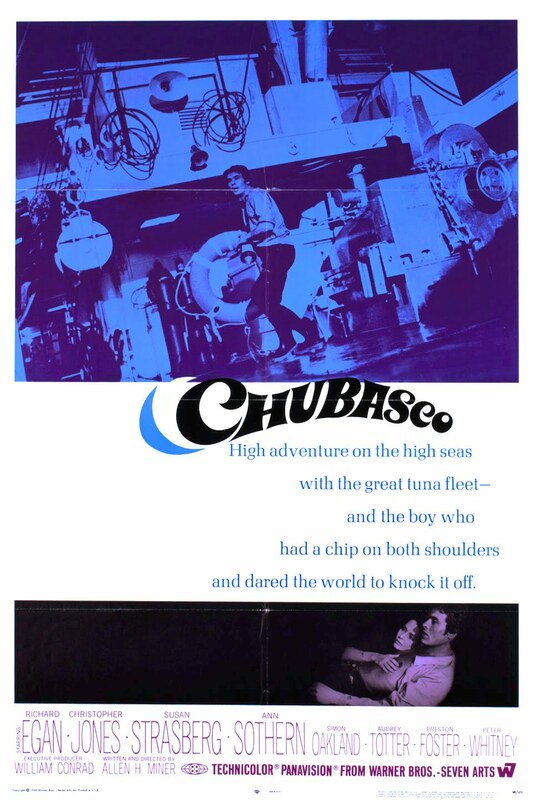 This oddly-titled obscurity is basically a vehicle for then up-&-comer Christopher Jones. Fresh from some Broadway success (including the original run of “The Night of the Iguana”) & the title role in the short-lived, but fondly remembered TV Western, The Legend of Jesse James, Jones does his best James Dean impersonation here as the title character, a “bad boy” seeking to shed his image through working aboard a fishing boat. Directed by TV vet Allen H. Miner with no particular panache, barring some nice open ocean scenes, the film also features Jones’ then wife, the lovely Susan Strasberg, crusty Richard Egan as her father, and grand dames Audrey Totter and Ann Sothern as the knowing grandmother & the knowing barmaid respectively. But the main draw for me is the presence of Simon Oakland in his trademarked “tough, but compassionate” role as the boat captain. Oakland excels as cops & bosses throughout his career, from West Side Story to The Night Stalker, and here he brings just the right touch to what could otherwise be a somewhat overheated melodrama, making this a must-see for fans of this underappreciated character actor.